Once again, most of the syllabograms dealing with crops & produce are relatively straightforward. However, a few words of warning. First, we notice that some ideograms have more than one meaning, as in the case of KANAKO = saffron, which is the dye derived from the crocus. So this ideogram also means “crocus”. Likewise, RINO means “flax”, but it can also (though rarely) mean “linen”. 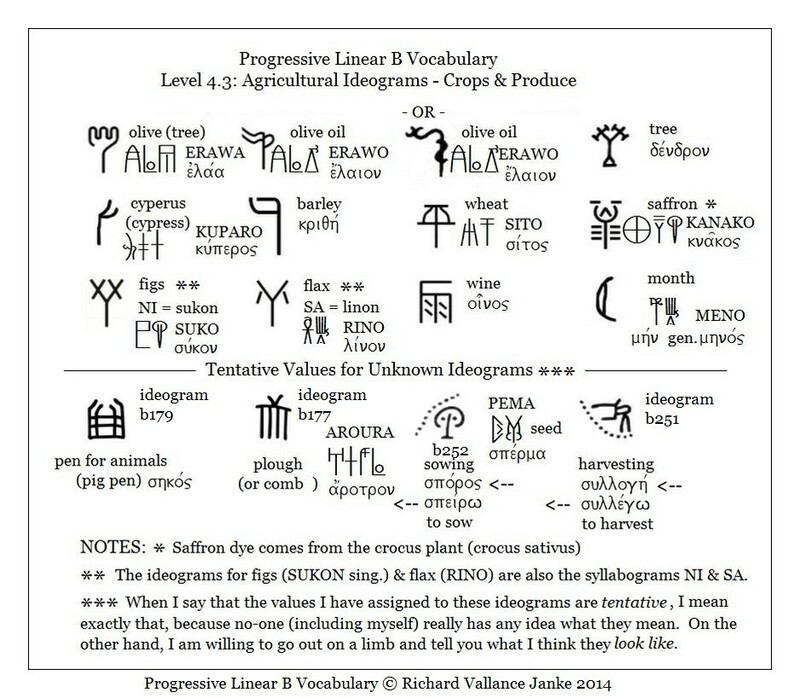 Secondly, it is absolutely essential to bear in mind that some syllabograms (in this case, NI & SA) are also ideograms, so that in translating Linear B tablets, you must take this into account; otherwise, you may read the character as a syllabogram instead of an ideogram, when in fact it is the latter. The tabular context should, however, make it quite clear which one is meant. Finally, I have decided to go way out on a limb, and attempt to guess what the meaning (so-called) is for each of 4 ideograms for which there is no assignable meaning. Why did I do this? Why not? No-one else has, as far as I know. So it might as well be me. Perhaps at some point in the mid- to far- future, some new Linear B tablets will be unearthed, and may shed a little light on the true “meanings” of these syllabograms. In the meantime, you certainly should not assume that the “meanings” I have dared to assign to any of them is even remotely accurate, although I for one took a long, hard look at each one of them before I intuitively leaped to my “conclusions”. I invite anyone familiar with Linear B, above all Linear B experts, to shoot my hypothetical guesses down in flames. Someone surely will. If you are that person, please leave your comments on this Blog, so that we can further discuss the ramifications. People familiar with or experts in Linear B will surely notice that some agricultural ideograms are missing from this table. There is good reason for this. It will all come clear in the near future.